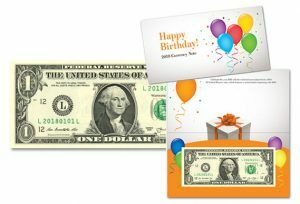 If you’re looking for a unique yet inexpensive gift for birthdays, the Bureau of Engraving and Printing (BEP) has a brand new money product you may want to check out. The BEP is now selling the "2018 Happy Birthday Currency Note" which features an uncirculated $1 Federal Reserve note with a serial number beginning with "2018." 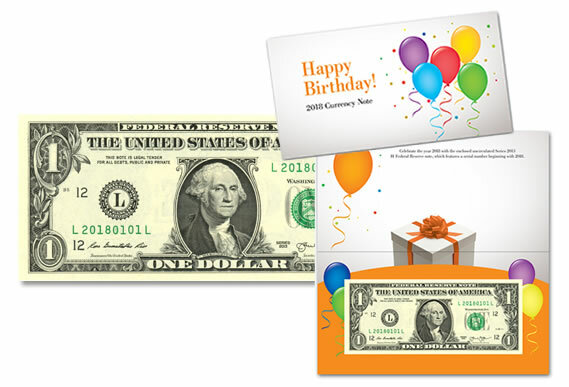 Priced at $5.95, the dollar is presented in an attractive birthday-themed folder and protected by a clear, acid-free polymer sleeve. Last year’s Happy Birthday $1 note is out of stock and those for 2016 sold out. i never thought about collecting bills until I started looking at old American notes. The art work is truly amazing. Sadly I cannot afford to collect both coins and bills at this time, and coins are my passion. Older American bills are worth having framed and hung on a wall as quality art. Would be nice to see the mint design a series of collectible bills with old world art and a low mintage similar to proof numismatic coins. I believe they would be an international hit and also very profitable for the mint…and hopefully collectors as well lol just a thought. Correction to my post: not the mint but the BEP.